One of the nice things about involving myself in clubs and activities are the opportunities to practise skills outside of my regular domain of computer science. 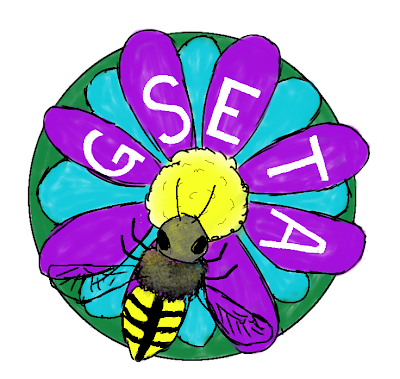 GSETA organised a button-making workshop in the campus University Centre this past week and I got to touch up the existing logo and design a couple new buttons for the event. With the logo, I just converted it into an SVG to ensure smoother lines (unlike the rougher one I carry on my shoulder bag). The second design I did I wanted to put some emphasis on the environment, so I wanted to show the sky and the Earth. 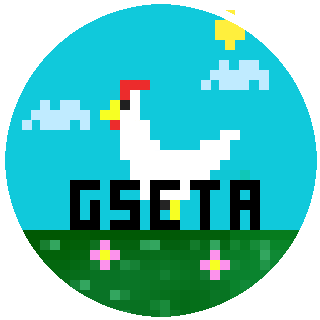 However, the A in GSETA does stand for animals, so what better an animal to situate in a landscape than the noble, tall-standing chicken! I also wanted to make one that appealed to a slightly different audience than the pretty flower, so following a personal interest, I made it an 8-bit chicken. Chasing cuckoos in Zelda recently might have contributed. Behold, a truly free ranging fowl! I was concerned that they might not translate well onto paper, but I was quite satisfied and they were quite popular! 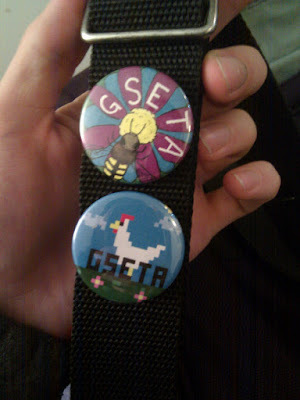 buttons 7 and 8 on my shoulder bag!